More and more people are opting to use multiple monitors on their home and work computers. Imagine how much more information you could view at one time if you were to double, triple or sextuple (that’s 6 times!) the amount of display space you had. Multi-tasking becomes exponentially easier as your available screen real estate increases. The ability to have word documents, excel spreadsheets, webpages, media players, and photo-editing software all open and visible simultaneously makes it easier to quickly work between them. If you’re looking to add a second monitor, your computer might have a second display port built in. If yours doesn’t, or if you’re looking to add monitors beyond the 2 ports available, you’re going to need another solution. 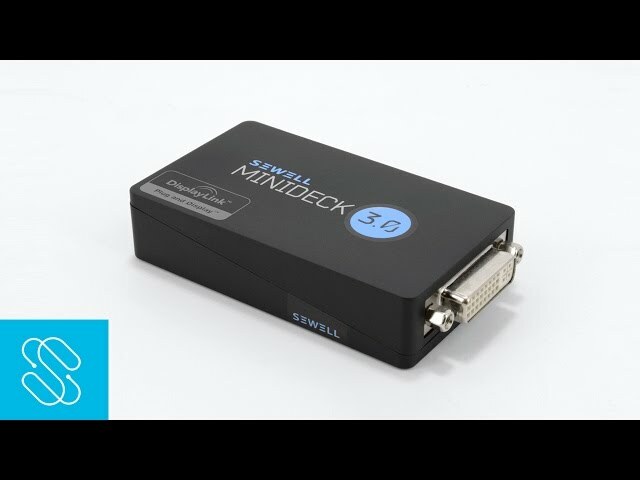 The Sewell Decks Series is a line of external graphics cards, giving you the ability to add a monitor through a simple USB port. With Sewell Decks you can use up to 6 monitors on one computer, and are easy to install. They all feature a USB connection on one end and a display connection on the other end (VGA, DVI, or HDMI). Each unit features a built in video card to handle all the extra data processing it takes to add more monitors.